The 2005 Girard Artistry is a proprietary blend of 54% Cabernet Sauvignon, 22% Cabernet Franc, 14% Petit Verdot, 9% Malbec, and 1% Merlot. The fruit is primarily sourced from vineyards located in the Oakville and St. Helena appellations of Napa. The first noticeable character of this wine is it's deep and dark color. Although it's five years old it maintains it's incredible dark ruby color. On the nose I get intensely ripened black fruits such as black raspberry, black cherry, and black plum. 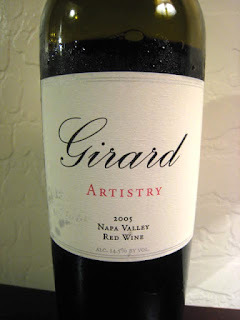 There is also secondary notes of mocha, graphite, licorice, and oak. The nose is very typical of the current Napa style which seems to be switching to a more ripe and more chocolate laden aroma profile. On the palate the wine continues to demonstrate it's ripe black fruit flavors with beautiful cassis, black licorice, and almost prune-like characteristics. There is some very pure black cherry notes that also combine with subtle hints of toasted oak.